Just under two weeks until Ironman UK. I havn’t done a lot of training since Ironman Germany. 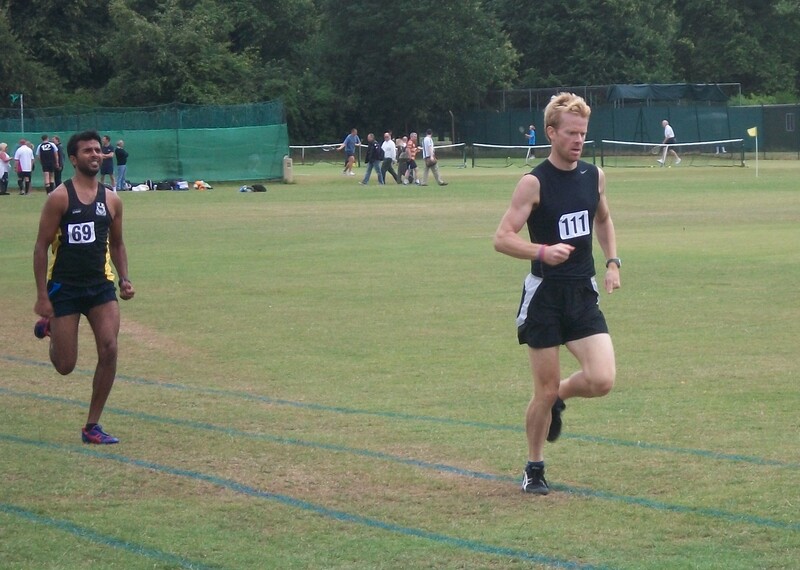 It took the best part of 6 days for the body to recover completely and, following a track and field event (below) last Friday I am sore again – damaged muscle fibres from track-racing. The glut and lower back pains are still showing themselves in the morning, which is annoying. I can race on it but I may have to have another physio session to loosen everything up and promote recovery. Mentally I’m back in the game though and I’m starting to get my gear together. I’ve sorted the front wheel/tyre issue on the Ceepo and created my own DIY bar stem bottle holder using a Minoura bottle holder. It means I now have the option of 2 x bottles (inc down tube) instead of the Speedfil. 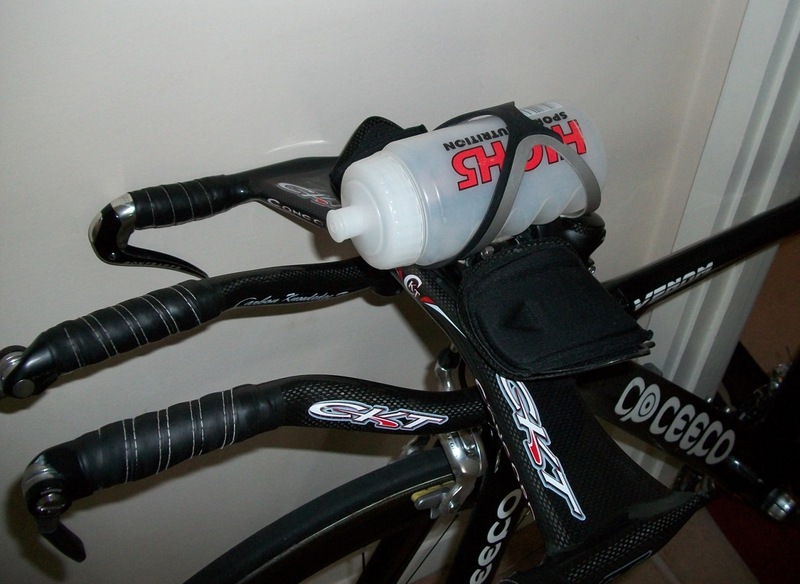 I went for a ride with several bottle holder options (inc behind saddle) the other day and this is my preferred set-up. It also helps free up a bit more space around the seat tube to allow faster wind movement on past the disk wheel. The Argon Mercury is currently being checked out by a mechanic. A replacement bottom bracket doesn’t seem happy in its new home! I then have the option of either bike come race day. 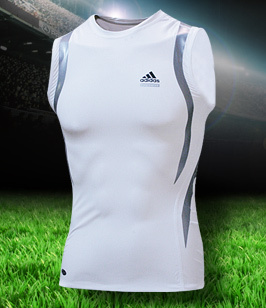 I’ll probably be wearing an adidas sleeveless techfit power top of IMUK, having received it as a birthday present from my girlfriend and found it to be very tight yet comfortable. It encourages good running form; I will have to see if the taped sections allow an aggressive position on the bike. Overall I’m feeling a lot more confident in Ironman UK. I’ll be staying at a Hotel for the Thurs and Fri before to relax and get everything prepared, register, rack bike and recce the courses. Then I’ll drive up and stay at a friend’s house in Preston for Sat and potentially Sunday night. 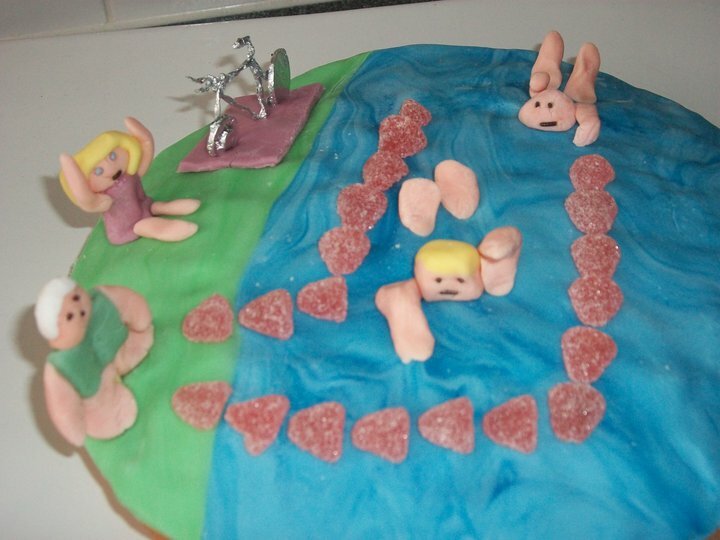 I’ve been taking part in the Department of Environment Sports Day since 1997, having missed it on only 1-2 occasions. I left the Civil Service in 2008 but I am still allowed to compete in Departmental and Civil Service sports events as I am an ongoing member. 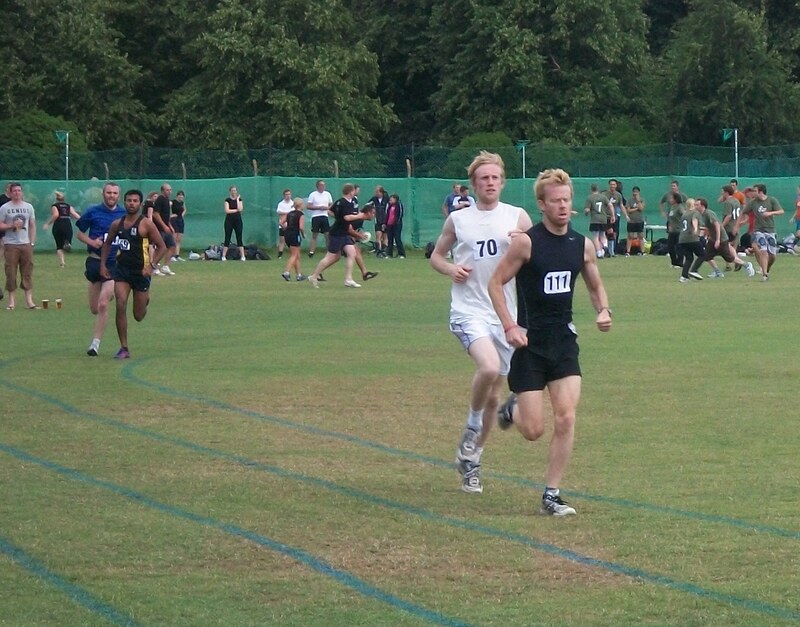 The Sports Day (just like many of the other Departments) comprises of several sports competitions (Football 5-a-side, Cricket, Tennis, Volleyball, also has a full track and field programme). The type of athletic events depends on the location. A number of novelty events are held, as well as plenty of food, BBQ and bar, finishing off with an awards ceremony and a disco. 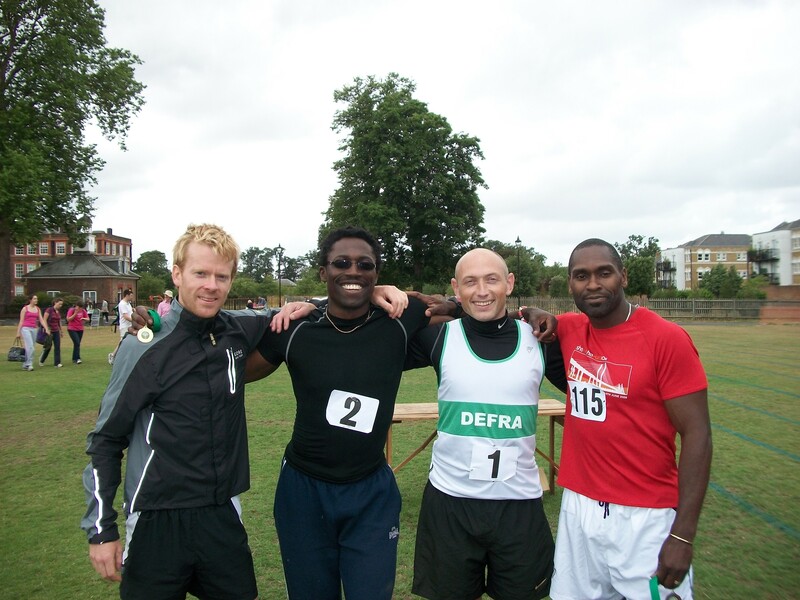 This year the Defra Sports Day was held at TPL Teddington. Usually a number of field events will take place, but this year only Shot Putt was available. The track was a 100m straight and 200m slightly bumpy oval grass track, which made the running events quite interesting. 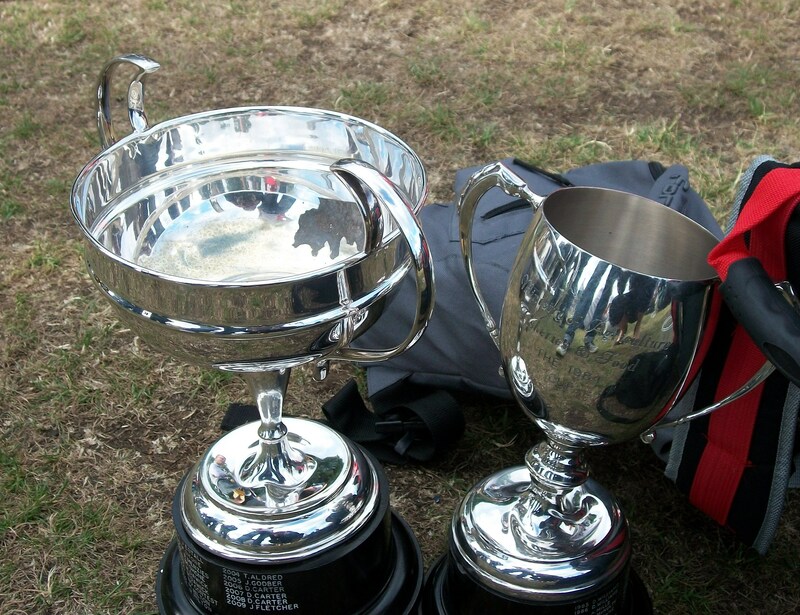 There are a number of cups awarded on the day to the athletes in some of the events, as well as overall best athlete cups. 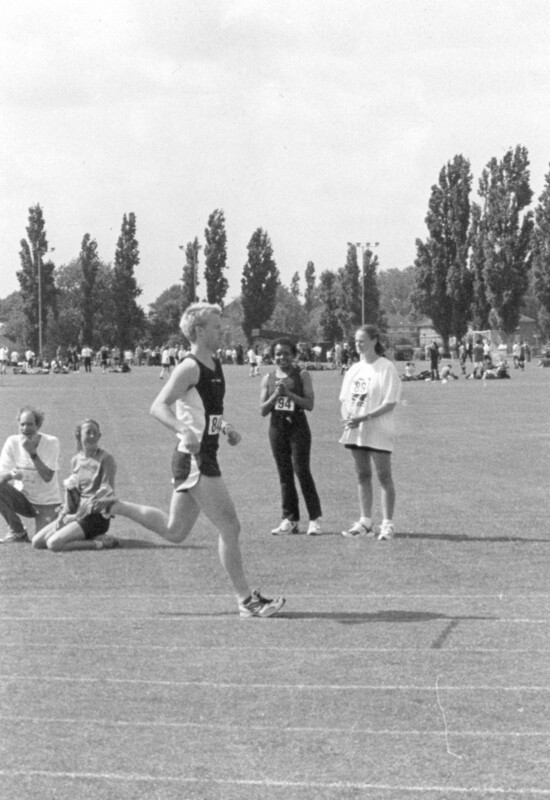 A number of decent athletes have worked for and turned up at Defra Sports Day in the past, the most notable being Chrissie Wellington (current Triple Ironman World Champion). She was always up for a laugh. The day started for me with the 400m Heats (x2). The protocol taken by the organisers for all events requiring heats are that if enough people have pulled out, then a straight FINAL will take place. This happens more often than not with a lot people staying behind at work. Unfortunately there was a programme clash with the Shot Put. After registering for the Shot I had to run straight back to the track as they were lining up for what I was told was a straight 400m Final. 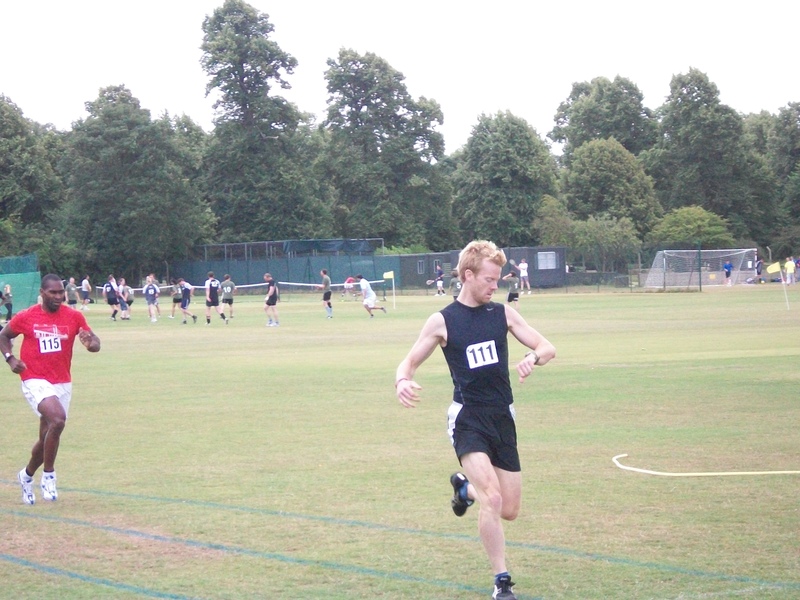 Before I had time to realise a couple of friends also down for the 400m were still at the Shot circle the race was off! There were only four of us and the standard was very low. I managed to run around at about 70% all-out (tt) effort. Just after the finish Manny and Glen came over and starting giving the organisers some for not announcing the heats on the speakers. The first Final was now deemed Heat1, and a second Heat was run. The Final was then back in the programme at a later time. Felt a bit sorry for the guys that came 2nd and 3rd, but it was the organisers that messed that up and at the end of the day the main guys were in the final. One throw..back went…no more thank you! You need a bit of backbone for the Shot Putt, which I don’t have! My original plan for the day was to just do the 800m and 1500m events. I was keen to try and get a PB in one of them as the markers were set many years ago and needed updating. Again, not a huge turnout, but I got into a battle with a guy (Vikram) I’d met at the Civil Service 10km Champs earlier in the year. I didn’t think I’d have a problem but he looked sharp and set a decent pace. The 200m track was a nightmare with a few light ups and downs on the back straight. It was also very difficult to overtake as the straight sections were too short. I kept on his shoulder right up to the back straight of the final 200m loop and then sprinted hard to try to get on the inside of the final corner. I didn’t want to chance a sprint off the final corner/50m. A bit wobbly but I got in front and then pulled away at the finish. He looked angry with himself at the finish! For a laugh I had a go at the 1500m walk with Glen, Emily and a few others, inc John Hall. John’s been team captain of Defra AC for many years despite retiring a few years ago. 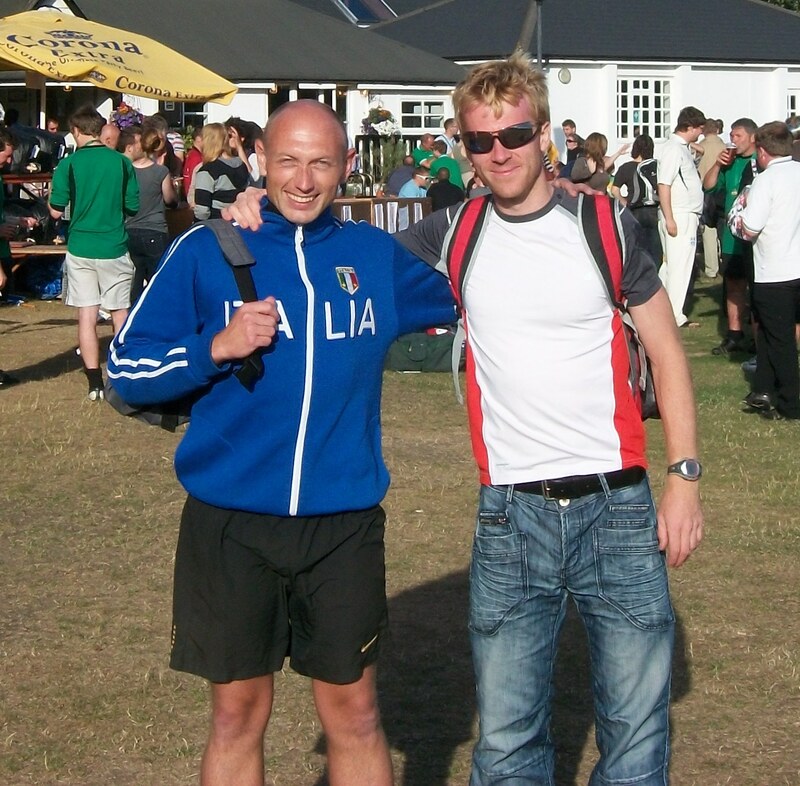 A very likeable and enthusiastic man, he’s an awesome walker….and I mean international standard walker. He won two walking distances at the last European Vet Champs. He decided to do an extra lap of the track (1700m) so as not to make the rest of us look stupid. I was almost lapped twice….! Started the walk with Glen, but then got an incy-bit competitive and wanted to see how quick I could walk. I caught up with Emily (eventual ladies best athlete winner) and another guy in 2nd and 3rd overall. Then surged in the last lap to get 2nd. Again, not a pretty sight, but I like to try new things. I also didn’t realise I’d gained 6 pts from this event. I’d been watching my friend Paul, Glen and Manny mixing it up with the other sprinters in the 100m and 200m races and now I got to compete against them in the 400m distance. Manny didn’t seem bothered and I think Glen was tired. Completed the distance in 63secs which I was quite pleased with considering the bumpy grass track. Final running event for me before I could start on the local draught beers! There was a cup for this one (I wasn’t even considering the 1984 cup), which I wanted to win. Much bigger line-up this time (around 15) including a few guys who’d finished their respective team events earlier in the day. My PB for 1500m is 4:44, so I was looking for 200m laps of around 38secs. The pace was tough from the off with one guy going 5m clear in the first lap. I was stuck behind 3 other runs, but I still clocked 36secs for the first lap. I couldn’t believe the pace they were holding and thought they would all tire at some point, but they didn’t. 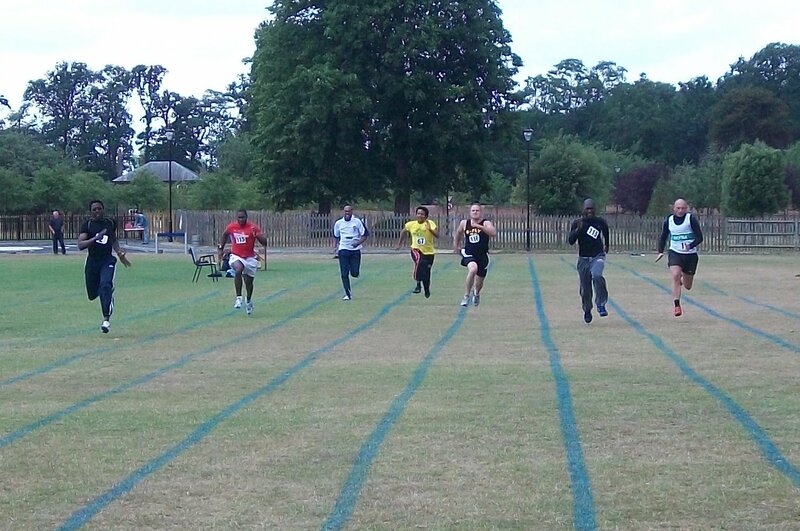 After 700m on the home straight I decided I had to make a move as the leader was a good 15-20m ahead. I sprinted past the three guys immediately in front and worked on closing the leaders gap. One of them stuck close behind me and I could feel him on my shoulder on some of the straights so tried to hold him off. The leading man had plenty of support from his team urging him on, and I just kept inching closer over each lap. With just over one lap to go I’d reached him and stuck right on his shoulder ready to make a move. Again, it was very difficult to find space but I felt like I had a bit more of a kick. On the back straight I couldn’t do it, but got as close as I could for the final 50m straight. As it levelled out he left the inside a little and I tried to go through the gap, but it wasn’t wide enough. So I dropped back over his heels and went on the outside. It took a big surge to reach him and then just inch forward and dip over the line. As the medal-man came over I didn’t know which one he was going to award me, but luckily it was the gold. Finished in 4:45, which I’m quite pleased with considering what happened beforehand. Chilled out for a while after this with Yve and the lads. Watched the 100m relay events. I used to love competing in these but decided not to risk it this year, especially as I was sandwiched between two Ironman events. 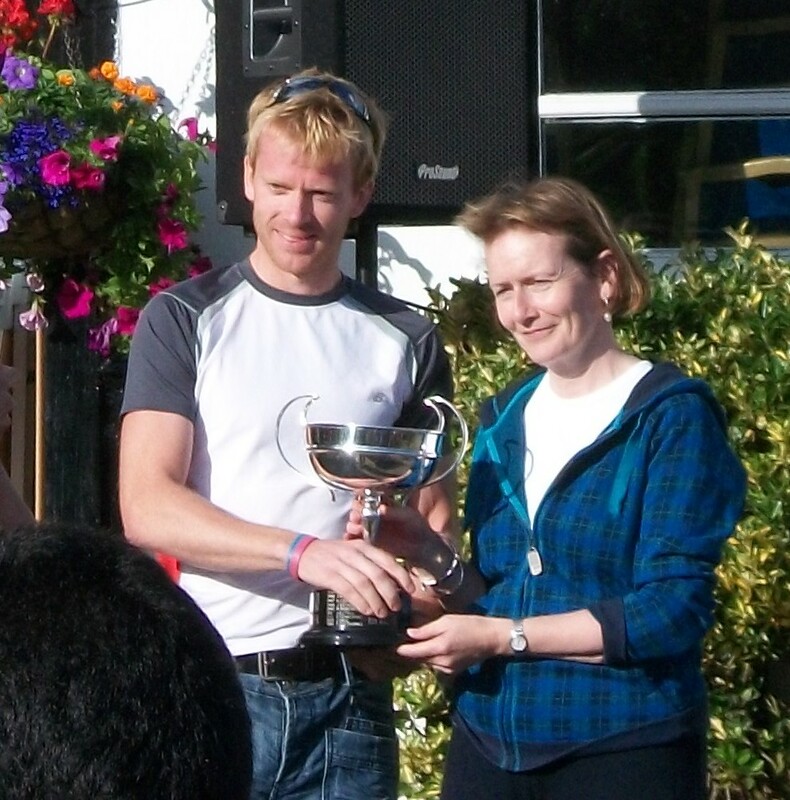 At the awards ceremony I picked up the 1500m Cup and 1984 Cup from Helen Ghosh. Nice to get the cup back after 9 years and in my 30s. I wonder if I can do the same in my 40s!? The other guys did well. 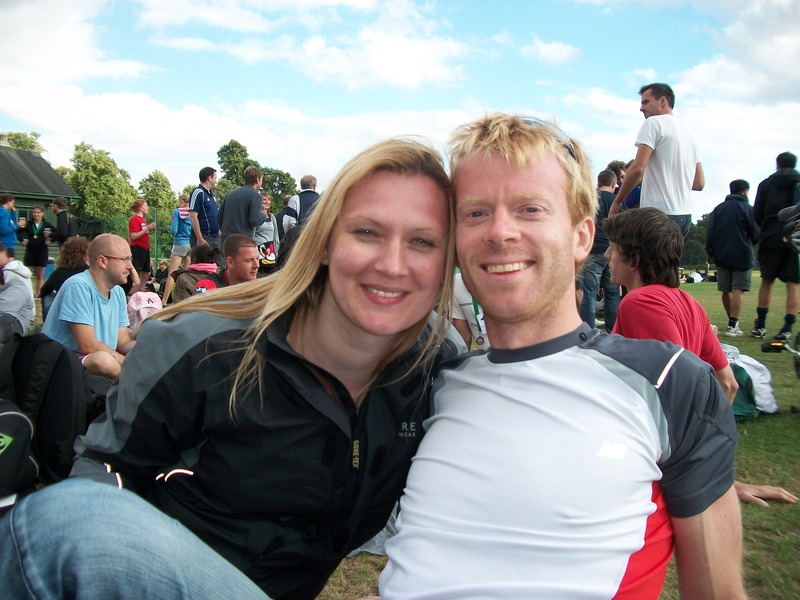 Staying at Paul Bland’s with Yve in a couple of weeks for IMUK. Very good sprinter (reached Semi Finals of 60m European Vet Champs), and will probably wonder what strange people triathletes are when he sees the event! Dont risk anything else different before IMUK!! !